Dudley is a wonderful boy with loads of personality! 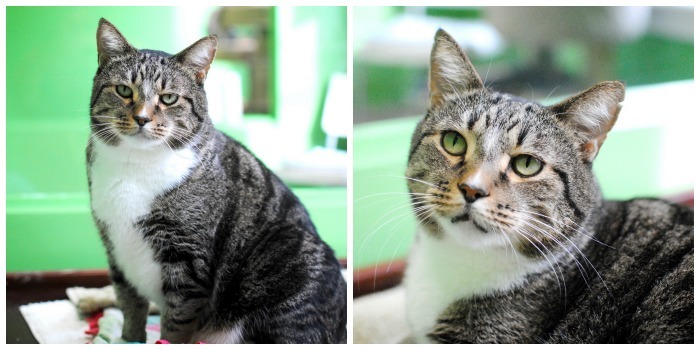 He is super friendly and outgoing and loves making new friends. Everyone that meets him thinks he’s just the greatest guy! His charming personality will put a smile on anyone’s face! Dudley was being fostered by a nice lady for about a year after he was hit by a car. Another rescue group took him into their program and helped with his care, including repairing his leg and amputating his tail. Dudley’s pelvis was previously crushed and did not heal properly. Because of some ongoing issues he will have, the rescue was unable to find him a home so they reached out to us to see if we could help him. Dudley does have some issues going to the bathroom. He is able to urinate and defecate but he doesn’t always feel it happening so sometimes he does not make it to the litter box. He is on a few meds to help, which he takes like a champ! Dudley is going to need a home with someone that understands his issues. He is a wonderful cat and he will be so worth it. He just needs that special someone to walk through the door and ask him to join their family!